Twin Falls lives up to its name, and more. This popular jungle waterfall spot in Huelo is the first major waterfall on the Road to Hana and is an easy drive from most of Maui. Even though it’s listed in many guidebooks as a stop on the Road to Hana, it deserves more than a quick visit, but several hours on its own. Don’t try to cram Twin Falls into an all day Hana excursion. The left trail at Twin Falls leads to a small waterfall and swimming pond. The right trail goes to another waterfall and pool, but there is another secret waterfall and pool above this waterfall, and yet another waterfall and pool above the second waterfall. The path gets steeper and trickier as it goes higher up. I’ve never been past the third waterfall to know whether there are smaller waterfalls and pools higher up the mountain. Along the trail to both waterfalls there may be other smaller waterfalls. This lush area of Maui is dotted with hidden waterfalls and pools that local residents prefer to keep secret, but there is no shortage of well-known waterfall trails with explicit directions. There is even a mini waterfall in the irrigation ditch (aka stream) in the gulch behind my house but it’s on someone else’s land. On a busy day, local families and teenagers and yes, hippies, swim and jump into the pools from the cliffs. Jumping is not recommended unless you are very familiar with the pools and know where the rocks and the deep spots are located. What’s great about Twin Falls is the trails are well-tended and relatively easy to walk on, so most people will have no difficulty reaching the lower waterfalls. Other waterfall hikes are more challenging and the trails can be confusing. 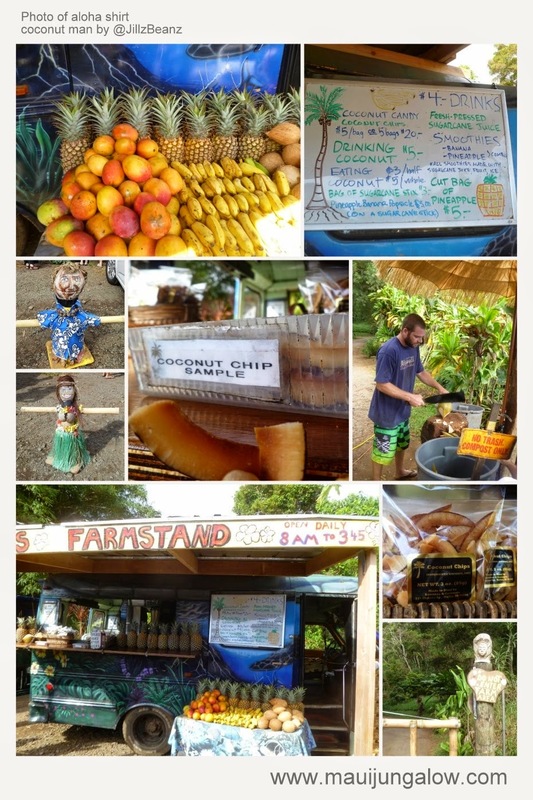 There is also a smoothie and fruit stand at Twin Falls, where you can get tropical fruits and fresh drinking coconuts. Twin Falls is owned by a hui (hoo-ey), a group of people sharing a common purpose, and they maintain the trails and the landscape, run Wailele Farm, take care of the parking lot, and make smoothies. You may see signs restricting access to residents only, and there are jungalows and dwellings hidden throughout Twin Falls. I know a few people who live here and have friends who used to be part of this hui, which I think of as a well-managed commune or intentional community. Twin Falls also offers inexpensive farm tours. Tips: Don’t leave valuables in your car, meaning do not leave them visible and do not hide them in your trunk. Leave them at home and take only the essentials with you. Twin Falls has a large parking area, very visible from the highway, and petty theft is common here. The parking lot may sparkle with bits of broken car glass. Petty theft is common at beach parks on Maui too, or at any popular pull over by the side of the road. Twin Falls is in a jungle, so expect wetness, mud, and mosquitoes. The water in the swimming holes will not be crystal clear, or even blue. Forget Hollywood movies. If you’re sweet, make sure you have mosquito repellant, preferably something without harmful chemicals. Also, waterfalls and hikes can be very dangerous during rainy periods, when there are flash floods. A notorious incident took place last fall, when hikers were swept off a waterfall near Twin Falls and it was captured on drone video. If you are participating in the A to Z Challenge, please use either Disqus or Facebook to comment below. Please include your link so that I can visit you back, but it might be as late as May! I'm past the halfway point, so I'm pretty sure I will make it to Z.